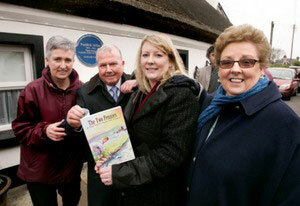 Pictured at the official unveiling of the Blue Plaque at the former home of Ruddick Millar are Alison Brennen (Proprietor Fool Haven), Alderman Sean Neeson, Susie Millar and Gillian Wicklow. 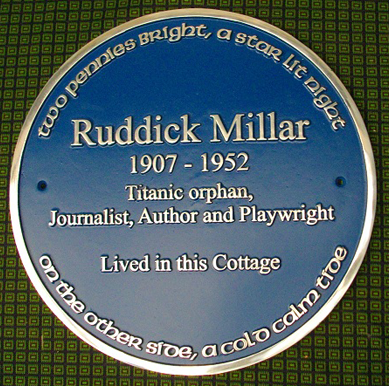 A PLAQUE to honour Titanic orphan and renowned Ulster author William Ruddick Millar has been unveiled in his native Carrickfergus. The former News Letter reporter was orphaned at the age of five when his father, a deck engineer on the Titanic, was killed. The Titanic liner struck an iceberg in the north Atlantic on her maiden voyage from Southampton to New York. It sank on April 15, 1912, resulting in the deaths of 1,517 people in one of the worst peacetime maritime disasters in history. Mr Millar was orphaned as his mother had died in January 1912. Susie Millar, his grand-daughter, yesterday said: “Our entire family are so proud to have him remembered in this way.” The author of Stirabout, When Johnny Comes Marching Home and The Land Girl was raised in Fool´s Haven Cottage in the Co Antrim village of Boneybefore following his father´s death. The plaque was unveiled yesterday at the cottage where he was raised by his great aunt. Ms Millar, herself a journalist, said in spite of her grandfather´s dire start, “he went on to live a very successful life”. She said: “My grandfather was just five years old when he was orphaned by the loss of Titanic. “He and his older brother Thomas were sent to live with their great aunt, Mary Millar, in Boneybefore. “She already had eight children and it was a tight squeeze in their small cottage. “Both boys were paid a small allowance by the Titanic Relief Fund, but I am sure it took some time for the paperwork on that to come through.” By the age of 18, one of Ruddick Millar´s plays was being performed at the Grand Opera House in Belfast. He continued to write plays for stage and radio, newspaper articles and books until his death aged 46 in 1952. Ms Millar said her grandfather´s account of his father “sailing away on Titanic and how he found out about the sinking as he sailed his own paper boat in the stream at Boneybefore has provided one of the fullest depictions of the effect of Titanic´s loss on an ordinary family”. The story has since been re-written by Ms Millar in the book The Two Pennies. She said: “The Millar family is delighted that my grandfather has been recognised in this way more than 50 years after his death. Fools Haven is where two local children, orphaned by the Titanic tragedy, were brought up. They had been sent to live in Fools Haven, with their Aunt, when their father sailed onboard the Titanic as an Engineer on that fateful maiden voyage to New York in April 1912. There were eight children already living in the Cottage, the addition of two more made ten. Susie Millar is the great granddaughter of the Titanic Engineer and granddaughter of Ruddick Millar – Titanic Orphan, Journalist, Author and Playwright. She has published a book ‘The Two Pennies´ A true story from the Titanic. It tells the true story of the Millar family and offers a unique insight into how the tragedy affected ordinary lives, in particular those of Thomas Millar´s two sons. Why not experience this Titanic Connection yourself and stay at Fools Haven Thatched Cottage.